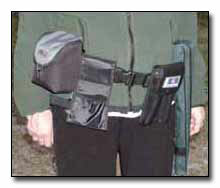 The OTG Belt organizes your equipment so all options are available at all times. By having your options available, you will have better opportunities to photograph. The belt is made from either a large camera bag strap, wide strapping or even the narrower strap from the digital camera case. The wide strapping and the plastic buckles in front can be found at most outdoor retail stores and the large camera bag strap can be found. The belt is sturdier and more functional if it is 1½" wide. Two carabiners were added to the belt to hold gloves, a baseball cap or anything else that might be in the way. The carabiners become really convenient especially when gloves are needed in the morning and not needed later on in the day. The monopod case, which weighs only 2 ounces, can either be left in the car or attached to your belt. Most of the time, you never use the monopod case since the monopod is usually always attached to your camera. But you usually bring the monopod case... just in case that you want to detach the monopod from your camera and store it out of the way. One extra set of additional batteries are placed in the camera case along with 4 extra memory cards of 128 MB each and a lens pen cleaner. 1) You have immediate feedback to all your photographs. 2) Numerous photographs of the same subject can be taken with different exposures, shutter speeds and zoom adjustments to produce different results (as long as it is not a temporary photo moment). Later, all unwanted images can be erased that don't meet your standard. 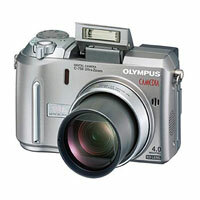 With those advantages, you will take many more photographs than with standard film.